Hey, that doesn't look like Bono! Bono and The Edge sure love their comics: In 1995 U2 provided the song Hold Me Thrill Me Kiss Me Kill Me for the film Batman Forever. Now singer and guitarist are hooking up with another superhero for a Broadway musical called Spider-Man: Turn Off The Dark. 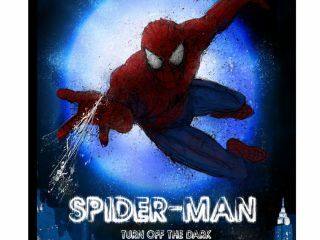 Long in the planning stages, an opening date has just been set - Spider-Man: Turn Off the Dark, featuring 'music and lyrics by Bono and The Edge,' will debut at the Hilton Theatre in New York City on 18 February 2010. Oh, and if you're a check-things-out-early type, preview performances begin 16 January. With almost a year to go before curtain call, the musical, to be directed by Julie Taymor, the creative force behind Disney's long-running The Lion King, is already a mega-budget affair - $31 million is the price tag on this baby. Which probably means one thing: it's be more than that. Big sets, big stars (no casting has been announced as of yet) lasers, special effects, not to mention a web-shooting superhero who flies over the audience - those bells and whistles don't come cheap. And then there's Taymor herself, no stranger to endless tinkering on her projects and delays. How will she tweak the production with U2 set to launch their new album, No Line On The Horizon, and the mammoth world tour to follow? Well, Bono and The Edge do carry their MacBooks with them everywhere, so they can monitor the show's progress from just about anywhere.